..why do they do that??? I have received many finch behavior questions recently so I decided to write on my experiences with them and why they do what they do. 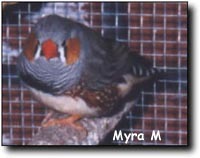 Most people do understand that finches are flighty birds which will never be confortable sitting on your hand, which is why they are kept in pretty cages in locations where many people can see them. Problems don't generally occur until the owners wish the birds to breed, or the finches themselves wish to breed. There are four basic stimuli your finch will react to; Predator, Mate, Dominance, Territory/Food (Territory and food go hand in hand because territories are picked because of their security and food supply). The reactions change over time as your finch grows up, then grows old. Predator reactions are often the most alarming. To a finch, if you are bigger than I am, you could eat me. That really make sense if you think that finch species are prey animals in the wild, They have the wide set eyes to help them spot threats even from behind with a small head movement. To your finch, you are the predator. So are your children and other household pets. Over time the finches will grow accustom to your presence and if you stick to a regular feeding schedule this will help the finch adjust to you quickly. Excessive fear will cause outright panic attacks and finches can die from this. Some species simply do not handle the stress of seeing people walk in front of the cage. 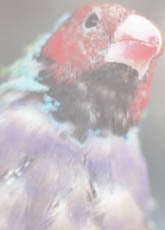 You can help to warn the finch that you are coming by whistling or talking as you enter a room. Night fright (also common in some parrot species) can be very deadly. When I was a child I was taught to cover the birds cage at night, and I really didn't have a clue why until years later. Unusual sounds or movements in low light can trigger a panic attack (night fright). The finch will fly into the walls of the cage violently and often beat itself to death. Now that I have more flight cages than anyone would want to cover every night, I use a small night light in the aviary room. If a night fright starts, the finch can see that there is no real danger and will calm back down. 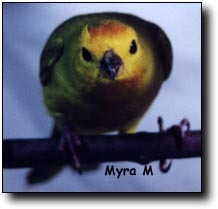 Young finches are not as quick to react to danger as the older more experienced birds. They must learn by watching how the others in the flock behave when you come into the room or approach the cage. This is why many people think they have 'tame' finches when the young first fledge. For about two weeks you can handle, pet, an hold the young finches. After that they will start behaving more like the adults. Mating Behavior is usually marked with a sudden change in behavior as the juvenile reaches adulthood. We all know the changes teenage humans go through as they reach maturity, finches go through a similar change that affects them the rest of their lives. What I hear about more often is increased aggression and increased vocalizations. Both sexes will begin calling out more to mark their territory and to attract a mate. A young finch is pushed away from its parents once the pair is ready to breed again. This aggression between parent and young speeds up the weaning process, with out it the young birds would take weeks longer than necessary to wean fully. The aggression is usually mild and consists of growling, chasing, and sometimes a little feather plucking for those more stubborn young ones. Keeping the young caged with their parents is possible but you must remove the icon which stimulates them to breed again; the nest. 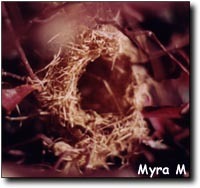 Without a proper nest the parents will often tolerate the young staying in their territory (cage). 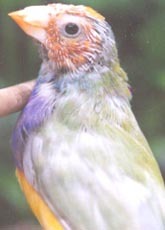 Males need an established territory, even though some may be only a large as the nest itself, to raise a family in and show off to the female. Many species of finch are very social and can be kept within the same cage as long as there are enough nests for everyone. Other species will fight to the death if another male is within reach. Once the territory boundaries are worked out, he'll call and sing to bring in the females and reaffirm his claim on the area. Females, while they don't usually go to the trouble of marking a territory will sometimes fight with other females over a good male. Females, like males, don't really like the competition; and both sexes may have several different mates. Once the pair has met, the male will often go into his song and dance routine to impress his female. If the female approves of him you may notice her raise and fan her tail. This gives the male just the right angle to proceed with mating. Various species have a variety of songs and/or dances they use. After mating a few times they will 'go to nest'. Simply put, they go about laying and incubating eggs. You may have heard the term 'sitting tight' if you have spent much time talking to breeders. Sitting tight is a very good sign. It means that whichever bird is currently incubating the eggs will not come off them even of you walk by the cage and peek in. It's a sign of a very devoted parent and usually results is a tightly bonded pair and healthy young.